There is a longing hope within mankind that death does not end all existence. But can we find a rational basis for believing in life after death? There are so many religions and so many philosophies as to the state of the dead that it is hard to discern the truth of the matter. As Bible students, we should refer to the Bible alone for doctrinal clarity. 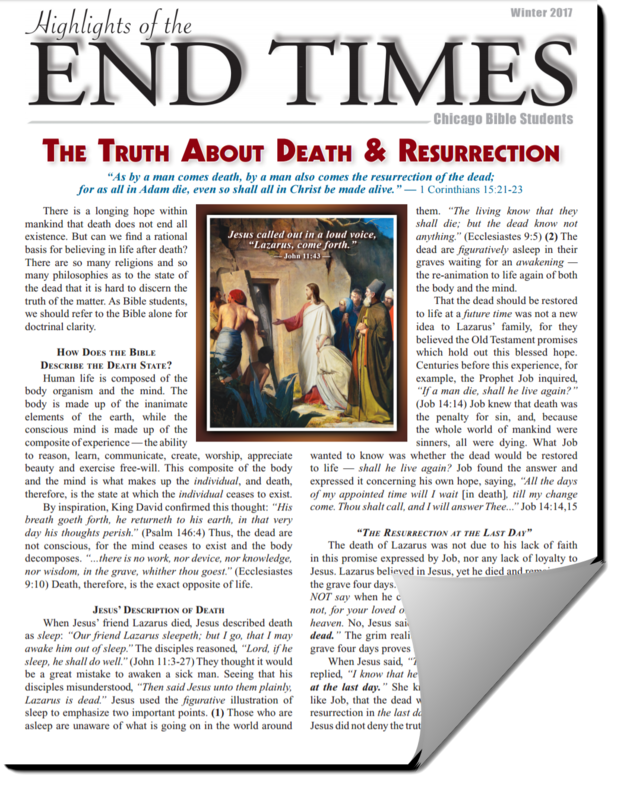 How Does the Bible Describe the Death State? Human life is composed of the body organism and the mind. The body is made up of the inanimate elements of the earth, while the conscious mind is made up of the composite of experience — the ability to reason, learn, communicate, create, worship, appreciate beauty and exercise free-will. This composite of the body and the mind is what makes up the individual, and death, therefore, is the state at which the individual ceases to exist. By inspiration, King David confirmed this thought: “His breath goeth forth, he returneth to his earth, in that very day his thoughts perish.” (Psalm 146:4) Thus, the dead are not conscious, for the mind ceases to exist and the body decomposes. “...there is no work, nor device, nor knowledge, nor wisdom, in the grave, whither thou goest.” (Ecclesiastes 9:10) Death, therefore, is the exact opposite of life. Bible Resources app: Available for both Android and OS phones, this free Christian app offers morning and evening devotions, hymns, Biblical videos, Biblical questions and answers, and past and current Biblical sermons. Each may be listened to online or downloaded, and saved to play when you don’t have internet access. Bible Trivia app: Available for both Android and OS phones, this fun free Christian app challenges your Biblical knowledge through a simple quiz game format that shows your accuracy and speed. You learn more about the Bible through a fun format. Additionally it offers a free guide to the Bible.